We kayaked today, and accidentally offended a few geese who looked like they were guarding a future nesting site. It was a beautiful day for a quick paddle. We snuck the trip in between chores and homework and a car appointment to remove snow tires, and dinner. Because sometimes you just have to put your paddle in the water. April 17th and we’re now sitting on our front porch, slightly sun-kissed, my husband with a glass of prosecco, and me with a Saranac lager. 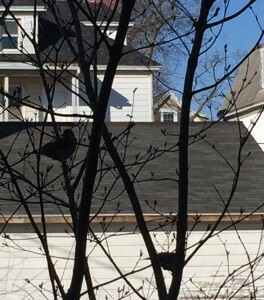 As we sit here, with a summer flag flying (two weeks ago we had a 3- inch snowfall) the birds are zipping in and out of the young maple tree on our front yard and then darting into the arbor vitae protecting the side of the porch. I’m not a birder, but I enjoy the antics of what I think are mostly chickadees and sparrows. The lilac bushes have new leaves, barely free of the bud. An occasional crow wings by, and the squirrels are busy raiding tulip flowers and bulbs. My tulips are in a shady part of the yard, so a bit behind my neighbors, and not yet so tasty. Time to sprinkle on some cayenne pepper. Across the street, someone brings out a box with a few chicks in it – I think our neighborhood will have fresh eggs this summer. In our backyard, we have a simple bird feeder that has supported birds all winter. And we have a half cask with a fountain, for moving water, along with a small forest glen of bleeding heart, Vinca, tiger lilies, lily of the valley, Song of Solomon, hostas, and wild geranium. We have frequent visits by morning doves, red chested finches, chickadees, gold finches, blue jays, cardinals, sparrows with forked tails, robins. The squirrels are the clean up crew, and we’ve had a visitor opossum, who I hear tell is the best defender against ticks that we could ever hope to entertain. We also have a local skunk that likes to play with one of our cats. They get along great, and no spraying has occurred. Our yard, about 600 sf in the back, about 250 in the front including the median strip between road and sidewalk (which we do) is now a Certified Wildlife Habitat. This is a great thing to do. Check their list and make sure you provide food, water, various shelters and use a couple sustainable care practices, and watch your yard come alive. It benefits your home, your neighborhood and the various species you support. Best of all it is amazing entertainment to see the life and ever-changing aspects in a well-living yard. Spring is for the birds, and for us all.